Mission: The mission of Room Circus is to alleviate the stress and isolation of hospitalized children and their families through the healing art of Clown, and to promote laughter and play as vital components of health and well-being. 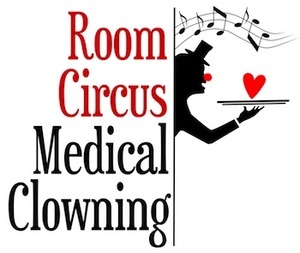 Room Circus Medical Clowns use music, physical comedy, improvisation and circus arts to help transform the health care environment. Stress relief, distraction, reduction of anxiety and pain and empowerment of patients are just a few of the measurable benefits. In addition, medical clowning helps build trust between physicians and patients, especially when a patient is feeling frightened or in pain, and has been shown to have positive clinical outcomes. Room Circus clowns reach through the barriers, pull out laughter, and create a circle of trust that encompasses everyone in the room - providers, families, patients and staff. Room Circus is a non-profit organization that operates off of the generosity of their donors and volunteers. They are not looking for volunteer clowns, because they use trained, professional clowns who have the skill and sensitivity to bring the most therapeutic benefit to patients. However, they are looking for compassionate, energetic people who want to contribute some of their time and energy to a good cause. Room Circus endeavors to expand its outreach to more hospitals and more days a week in Seattle Children’s Hospital. There are many different ways that you can help them attain this goal. Fundraising Committee - Working with other volunteers and staff or board members to help create and plan fun, original fundraisers, research grants, and work with major donors. Marketing/Communications Committee - Develop publicity plans for their events, develop general marketing materials about the company for expanding to other area hospitals, ensure distributed materials follow a creative company branding scheme. Fundraising Events Help - Promotion material distribution, day of event help. Office Support - Mailings, folding, data entry, rubber chicken repair, etc. Newsletter Creation – They need people with graphic design skills to gather and edit materials for quarterly newsletter, designing layout, etc. Facebook Curating - Spread reach of Facebook page, ensure content is posted regularly, ensure variety of content is posted, encourage sharing and liking. Donor Research - Research existing donors to see who might be able to increase giving, ensure donors are not being lost in the cosmic void, ensure donors are being contacted regularly.